Colombia’s former President Alvaro Uribe is investigated for murder by the Supreme Court, less than 10 years after he was given the Medal of Freedom by former US President George W. Bush. The investigation is led by Supreme Court President Jose Luis Barcelo, reported newspaper La Nueva Prensa after receiving a copy of the court order to increase protection for witnesses in the trial. Colombia’s Supreme Court denied on Twitter its president was investigating Uribe on murder and conspiracy charges, spurring journalist Gonzalo Guillen to make the court order public. Did Uribe form a death squad? 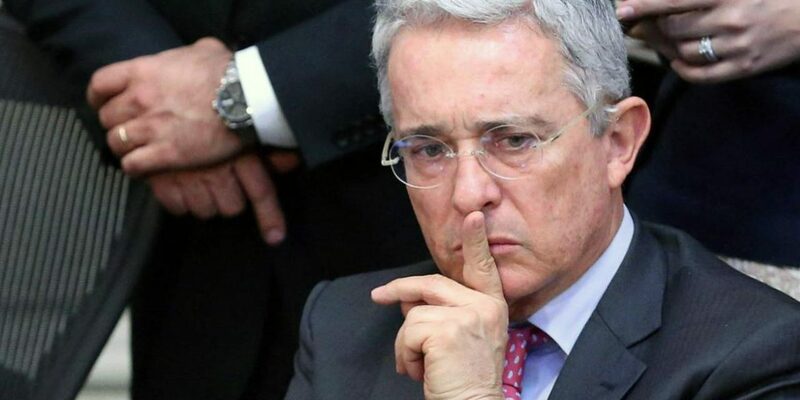 The court is investigating claims and evidence indicating that Uribe helped form the Bloque Metro paramilitary group while he was governor of the Antioquia province in the 1990s. Uribe has been accused of ties to illegal armed groups ever since he rose to political prominence in the 1980s when the Ochoa crime family, close friends of the the former president’s family, formed the Medellin Cartel. The court order seeks the increased protection of Juan Guillermo Monsalve, who grew up on one of Uribe’s ranches and says he was one of the founding members of the Bloque Metro. According to La Nueva Prensa, the court has evidence that Monsalve and several of his family members were threatened by associates of the former president. The witness survived two assassination attempts, which spurred Human Rights Watch to urge for an immediate investigation last month. As part of investigation number 54110 that the chamber is carrying out against Mr. Alvaro Uribe Velez for the crimes of conspiracy to commit a crime, homicide and others, the testimony of Juan Guillermo Monsalve Pineda will be important, considering that, as he claims, he is an eye witness of several of the claims related to the charges. One of the main challenges of the investigation is keeping the witnesses against Uribe alive. One of the witnesses against the former president, former paramilitary fighter “Tasmania,” went into hiding on Wednesday after surviving an assassination attempt. Another witnesses was assassinated in April in Bello, weeks after he was released from prison and left without security. Multiple other witnesses and key associates of the former president were assassinated or died under suspicious circumstances over the past years. Guillen, the journalist that revealed the murder investigation, is also enjoying strict security measures after multiple death threats related to his investigations into criminal enterprises of politicians. The founder of national news agency Colprensa and former editor-in-chief of multiple newspapers has been forced into exile on numerous occasions. Uribe has consistently denied that he and his brother helped form Bloque Metro with his neighbors.